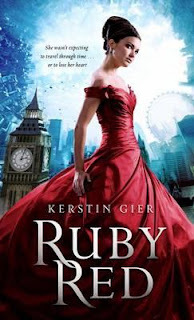 The Compulsive Reader: Cover Talk: Kerstin Gier's Gorgeous New Covers! Anyway, I'm very pleased to report that I saw a release date for Sapphire Blue on Amazon, along with a summary and a brand new cover design! A few Google searches later, and voila! I found the cover redesigns! Though I really liked the classic, fairy tale-esque look of the original cover (below), I am in love with the new covers. The dresses are gorgeous! Check them out! First off, those dresses. They are stunning! They really capture the eye. But, what I think I like the best about them are their backgrounds--London scenes with swirly time vortexes or whatever they're supposed to be. They fit with the whole time travel thing, and just add to the drama of the covers! I love them! 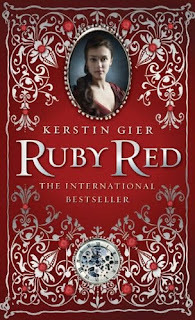 The paperback edition of Ruby Red will be out May 22nd, 2012, and Sapphire Blue will be out on October 30th, 2012! I can hardly wait! The covers are pretty, but there are so many YA covers with girls in gorgeous dresses. I think I prefer the original covers. I really like the new covers! I mean, they definitely are more commercial, but what can you do? Cannot wait to see how the cover of Emerald Green (I think that's what the third book is titled) looks like!! I LOVE these covers...Seriously, I WANT that purple dress to wear to prom. I think they'll definitely sell better and it makes me want to go read my copy of Ruby Red right now...in fact, maybe I'll read it next! Wow gorgeous covers I definitely love them. 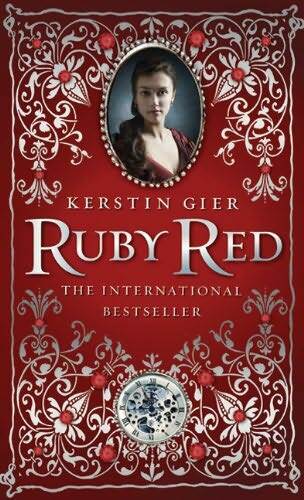 Ruby Red was such a great book to read. 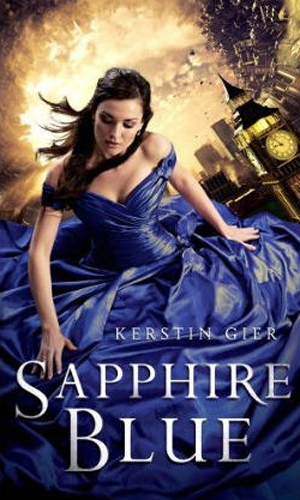 Such a unique time travel book and I am very excited for Sapphire Blue even though it's nowhere close to coming out. I still love the original cover though, it's what attracted me to Ruby Red in the first place, but still amazing job on the new covers. I do like the new covers, though I don't think I had seen the "originals" before, mostly because the only version I've seen IRL is the Spanish one! It looks like it's the same dress only in different colors. Honestly, I prefer the original. There's such a massive outpour of YA books now with the 'girl-in-a-pretty-dress' cover. There was nothing wrong with the original and it's something I'd actually pick up rather than the new ones. I agree with Cialina. I like the new covers, but the silver embossed foil of the original is gorgeous in person. But, I agree that the new ones are definitely more commercially eye appealing. These are just breathtaking..i admire the effort put into creating the covers! Wow, I somehow totally missed this book but after seeing those amazing covers I had to check it out. It sounds incredible and I just added it to my wish list. Definitely going to have to check it out. thanks!